Lately, I have been in need of a light but hearty satisfying dinner that is easy to fix during a busy workweek. This recipe came about as I tried to figure out what to do with some extra roasted sweet potatoes and a large handful of kale. My empty tummy decided it would be the makings of a perfect quick dinner--and it was SO right! 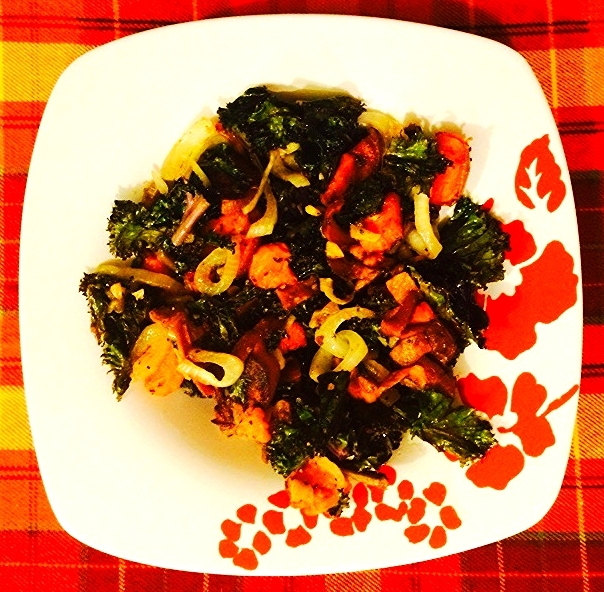 The trick to elevating the flavors of this dish (and removing some of the bitterness of the kale) is in browning the slices of roasted sweet potato in ghee and then sautéing the rest of the ingredients in more ghee and spices. After trying some variations on this recipe, I still prefer roasting the potatoes first before sautéing because it ensures they are fully cooked through and lends a richness to their flavor. I think this dish is perfect on its own, but if you feel like you need a little more substance to it, it tastes equally great as a side to sausage or a good pork chop. Preheat saucepan on medium, adding 2 tbsp ghee to melt. Slice roasted sweet potato in half longways and then slice each half into half-moons. Place half-moons in saucepan and let cook until brown on one side, about 2-3 minutes; flip the half-moons and let cook on the other side another 2-3 minutes. When the potato is browned, add onion slices, garlic, and cumin and sauté for 2 minutes, until onions begin to soften. Then add more ghee and kale. Reduce heat and let simmer on medium-low until kale begins to wilt, about 5-7 minutes more. Add salt taste. Serves one (so double the recipe for you and your loved one!). Enjoy!